Earlier this year I wrote about how gay marriage activists had successfully used stories to influence public opinion in the U.S. in favour of gay marriage. In a recent article in the Atlantic, Molly Ball wrote the idea behind that strategy. This, she writes, is another lesson Marc Solomon, the national campaign director for Freedom to Marry, believes other movements could learn: Make an emotional argument based on positive values. “For years, pollsters told gay-marriage advocates that attacking discrimination and invoking the Constitution were their most resonant arguments—but over and over, these cerebral ideas proved no match for the visceral appeal of the opposition’s messages about family and faith. And the emphasis on rights convinced many voters that what gay people wanted out of marriage was fundamentally different than what they thought marriage was about. The other thing gay marriage campaigners did to spread their message was to use a sophisticated persuasion campaign—a tactical innovation that many others are now trying to emulate. “Armies of canvassers—both paid workers and volunteers—set out to have in-depth conversations with thousands of voters using ideas developed with help from the liberal Analyst Institute, a quasi-academic campaign-tactic lab. 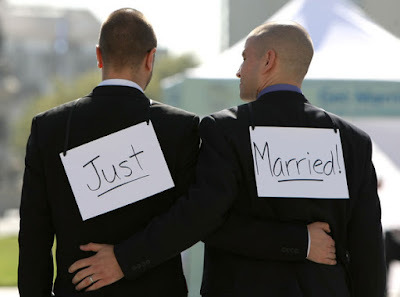 Promoting a positive, emotional, personal message wasn’t the only thing that helped them win the day—gay marriage campaigners also used some sophisticated and targeted political and legal strategies. But changing their message to emphasize personal stories of real people created the conditions where they could show public support for the political and legal arguments—a key element in the overall, and winning, strategy.